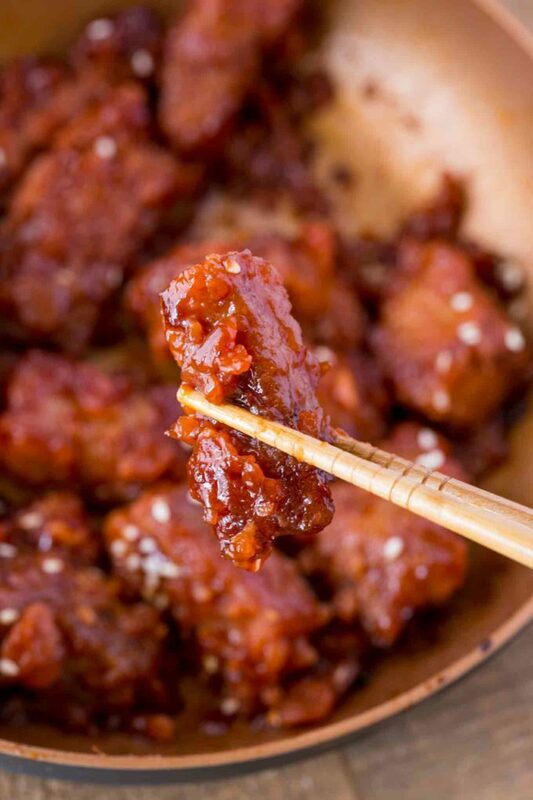 Pork Char Siu made with pork tenderloin in a garlic and ginger spiced marinade with Chinese 5 spice powder and hoisin sauce, this is a healthier spin on the classic Chinese takeout favorite. 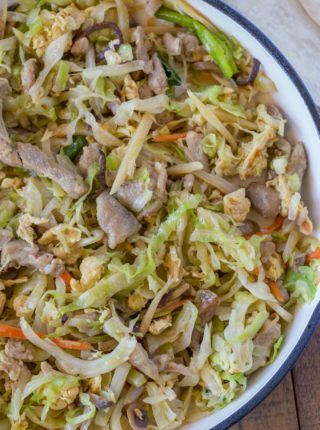 We’re loving healthier versions of Asian recipes on the blog and every time I post a new one you guys send in requests. PS I LOVE the requests so please keep them coming! You can email them over if you’re on the mailing list (shameless plug for you signing up to get emails) or just leave a comment below with your requests. This request came from Mary M. who loves Char Siu and Sweet and Sour Pork. 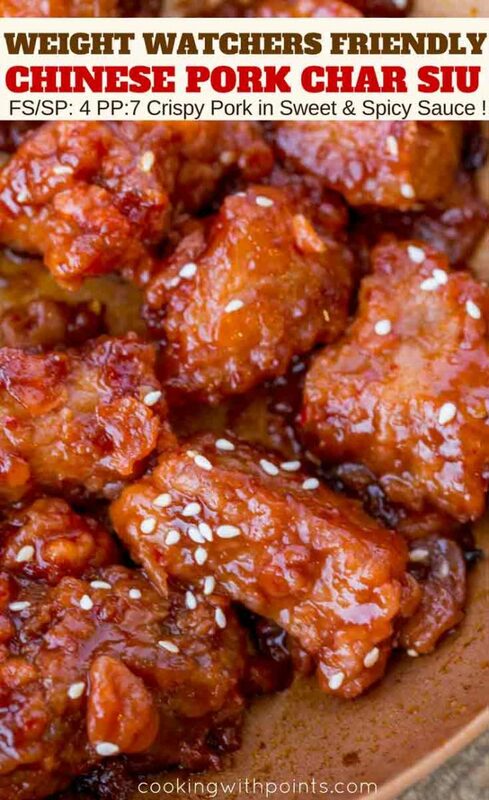 You can skip the breading step if you’d prefer and make this recipe for just 3 smart points, but the crispy breading soaks up all the sauce for a delicious Chinese takeout makeover that will make you forget this is lightened up! 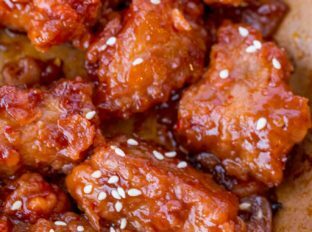 We are making a cross between sweet and sour and char siu, so you’ll see a bit more in the recipe that’s sweet. If you want to dial down the sweetness lose the tablespoon of sugar. Char Siu is traditionally made using pork shoulder thats cut down to the size of a pork loin, but in this recipe we’re using pork tenderloin which we cut down to allow for high heat and quick cooking. If you want to use a larger cut of pork, you can use a pork loin for just slightly more points per serving. This will allow for a more tender cut of pork. What makes Char Siu red? Char Siu is red in cooking based on red food coloring, which we don’t use in this recipe. Traditionally the red coloring is not part of the recipe but in American restaurants it is often added to enhance the look and give it a smoky red ring around the pork. Can you make Char Siu ahead of time? Yes, if you’d like you can marinade the pork for a longer period of time (up to 24 hours), but if doing that I suggest leaving the cuts of pork larger so they don’t get too seasoned. What to serve with Char Siu Pork? 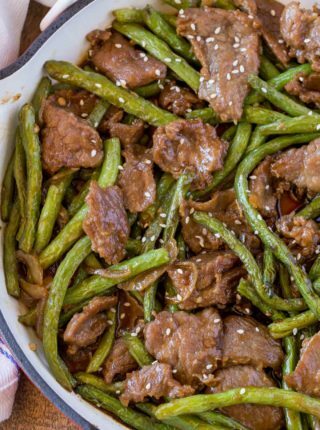 This recipe is perfect to serve with steamed rice or steamed cauliflower, Thai Green Papaya Salad, Skinny Chinese Green Beans and Skinny Kung Pao Chicken. Add the marinade ingredients (except the cornstarch slurry) together and let marinate for 1 hour. Add the pork to the egg mixture then dust lightly in flour. Add the pork to a skillet with the canola oil on medium high heat and brown well, 2-3 minutes on each side. Remove the pork from the pan and add in the marinade. Cook until reduced to about half, 5-7 minutes. Add the cornstarch slurry and cook until thickened, then add the pork back in. I have been craving Char Siu lately–so this recipe comes at a perfect time. 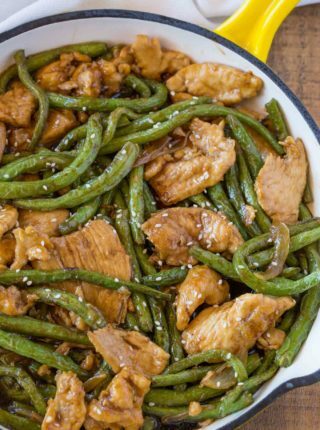 So much better than takeout! I cannot wait to try this out! 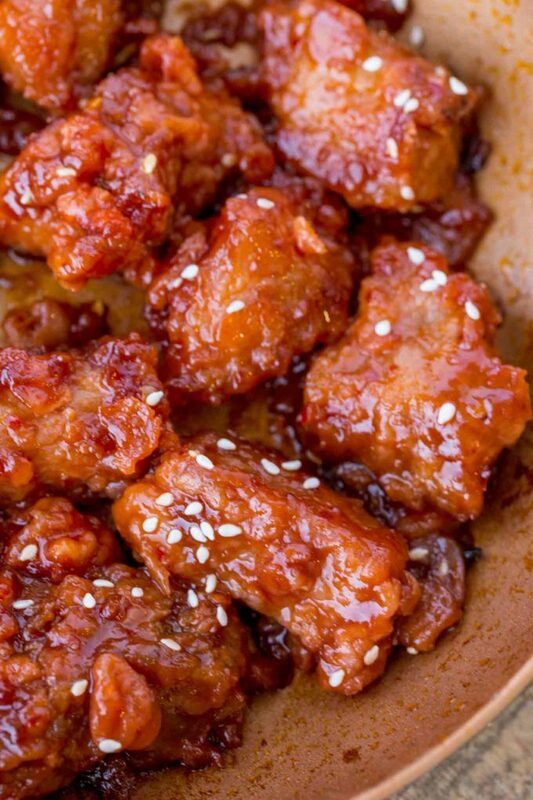 My husband LOVES Chinese pork, so I’ll definitely be making this soon!! I have never had this before but the flavor sounds so good! 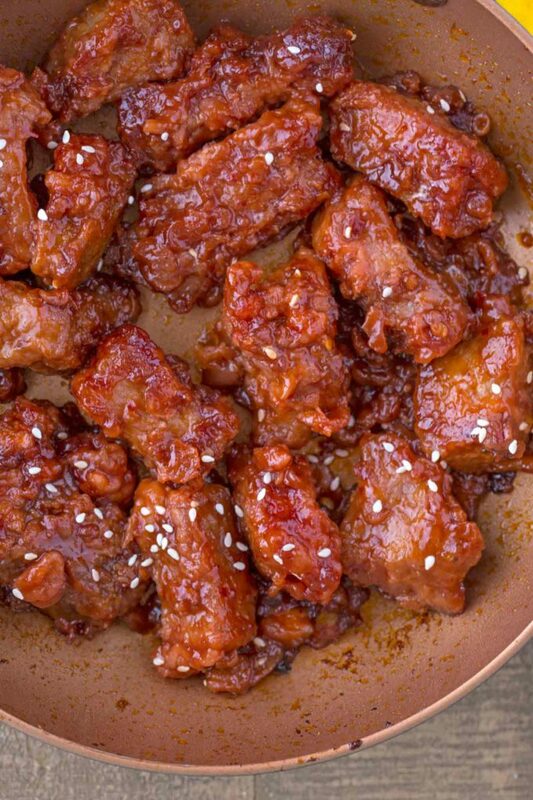 My husband loves pork so this is a must try! Hope he loves the recipe! 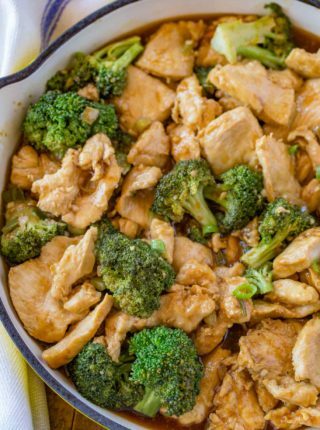 Such a great healthier twist on a flavorful dish! This looks amazingly delicious! A sure hit with my family! There is and unfinished sentence under the section “Best cut of pork “. Curious as to what it says , thanks . Robin, thanks for pointing it out, but I don’t remember where my train of thought was when I wrote it! I’ve at least fixed it so that the sentence isn’t incomplete now . I just LOVE the flavor of Chinese 5 Spice! Sorry if this is silly – do I mix the marinade and then add the pork for 1 hour, or mix it and just let it sit for 1 hour? Sorry this got caught in my spam filter. Add the pork to the marinade and let it sit together for one hour. Wow!!! This just makes me mouth-watering the whole time. I need to make that immediately!